I am going to let you in on a little secret. When I was a child I hated vegetables. Fortunately for me my mum didn’t believe in force feeding anyone anything, so as long as I was willing to eat salad and never refused to eat anything I hadn’t tasted I didn’t have to suffer the horror of broccoli. I have since discovered that there is a scientific reason why children don’t like vegetables, their bitterness receptors are more developed in order to get them to spit out any poisonous plants they might ingest during their adventures. This changes with adulthood, which is why many adults discover a love of vegetables in later life that they hated as children. I am lucky enough to be one of those people and one of my absolutely favourite rediscovered vegetables is courgettes, which is why I found this recipe so delicious. Credit to Mandy from Kitchen Joy, whose original recipe I adapted. Preheat your oven to 180 C. Grease a baking dish with the olive oil. 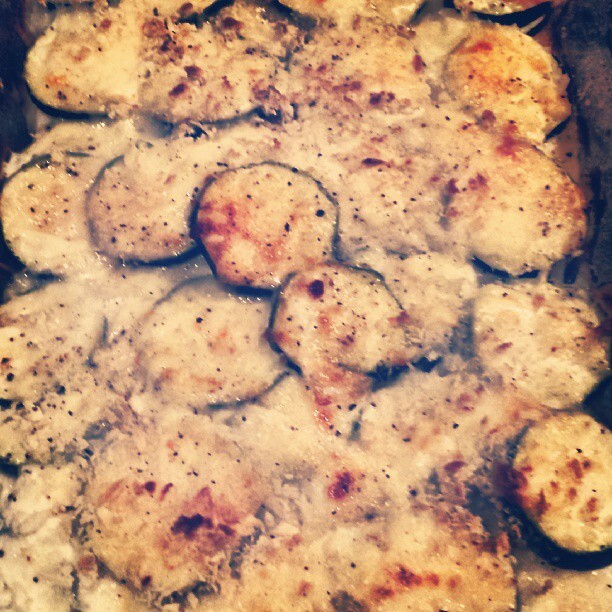 Cover the bottom of the baking dish with a layer of the courgette slices. Sprinkle with a little salt and pepper. Spread 100ml of the creme fraiche over the courgette slices. Sprinkle over 1/3 of the mozzarella cheese, 1/3 of the Port Salut cheese and 2 tablespoons of the Parmesan cheese. The sprinkle over 1/3 of the Panko crumbs. Repeat this another two times. Bake for 40 minutes until golden brown on top. If you don’t have a brown top after 40 minutes, just pop it under the grill for a couple of minutes more.